GMC have been MCS registered since 2011 and install solar panels in Northumberland, Durham & Cumbria while constantly jumping the border to install more systems in the Scottish Borders, Berwickshire, Roxburgh, Dumfries, Peebles, The Lothian’s & Fife. We install between 50 – 60 systems per year ranging from small home owner systems to much larger commercial systems powering farms, factories, hotels and more. The systems operate exactly the same but more panels mean more power! GMC is a family run construction business who employs skilled trade’s men to carry out all our work, from the scaffold to the electrician all our staffs are fully trained solar Engineers. Experts in their own field from the roofer to the system designer. All our systems are designed in house with a wide range of products to suit different homes and applications. A huge range of solar panels to choose from. GMC run a personal solar PV service. You meet one person who takes you from the first phone call to helping you fill out the application forms. This project manager stays with you for the whole journey! Watch one of our installations in the time lapse video below! Every solar PV system is made up of several components: solar panels (or ‘modules’), an inverter, a meter and your existing consumer unit. Zoom in on the diagram below to see how it’s all connected and understand how solar panels work. 5. 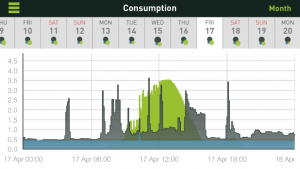 Any electricity you don’t use is exported to the grid. Welcome to our installation guide. 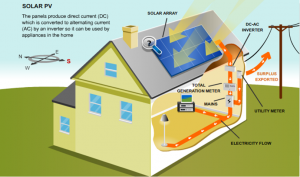 This is a guide for installing a retrofit solar PV installation on a domestic property. 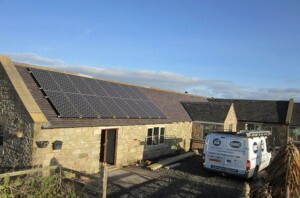 The guide will walk you through your solar PV Installation. We’ll usually send a team of four to fit each home system – a project manager, two roofers and an electrician. We match skills within each team carefully to make sure we cover all necessary areas of expertise. Your project manager will be responsible for making sure your project is completed on time and to our high standards. They’ll also explain the system to you and answer any questions. Most installs can be completed within one to two days, but some will run into three – for example, we’ll take more time when installing on roofs with slate or rosemary tiles as they’re more fragile. We can usually tell which projects are likely to take longer than a day, so we’ll be sure to let you plan for this well in advance. All you need to do is give us access to all the spaces we’ll need to work in – both inside and out. We’ll also need to use your electricity supply, water and toilet. We promise to keep any disruption to a minimum and tidy up before we leave. All the solar panels we stock are made up of individual solar cells, covered in an anti reflective glass sheet, surrounded by a lightweight aluminium frame. The weight of the panels can vary between 15 and 30kg depending on the size and manufacturer. These are the stainless steel hooks that screw into the rafters of your roof, forming a base for the mounting system. The roof anchors are hidden from view once the panels have been fixed on to the roof but are nonetheless a crucial part of your system. 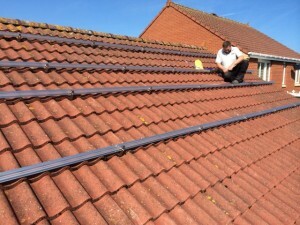 There are many types of roof anchors, and the one we use will depend on the type of roof tiles – there are different types for slates, rosemary and concrete tiles amongst others. Our in house technical team will assess which ones to use after we carry out your site survey. The frame is made up of two parallel aluminium bars or rails for each row of panels. The rails are attached to the roof anchors using a specially engineered locking system to ensure there’s no movement, then the panels are mounted on top and attached by clamps. When choosing the railing for your frame, there are options for black rails if you have all-black panels or panels with a black frame. Clamps hold the panels onto the frame. There are two types: end-clamps and mid-clamps. End-clamps are used at the end of a row of panels fixing the last one in place, while mid-clamps sit between two panels and ensure they’re spaced equally, usually 200mm apart. We use at least four clamps to secure each panel, and where black panels are used, we have specially coated black panels to help the mounting frame blend in with the panels. Our Install team are qualified to erect scaffold the team arrive with their own scaffold for the job. ,The scaffolding is erected to provide a working platform for our roofers at the eaves of the roof and safety rails that run along the edges of the roofs. We will always scaffold a roof, no matter how high or low as the safety of our installers is paramount to us. We’ll check the measurements taken during your site survey and make small chalk marks on your roof to show where the panels will go. The chalk will wash off next time it rains. The next step is to screw the roof anchors to the rafters. First we’ll check where the rafters lie in relation to the existing roof tiles. We’ll position the anchors on top of the tiles in their intended position, then double-check the measurements to make sure the frame will sit straight. The specific anchors we use as mentioned above will depend on the roof tiles you have. Each anchor and tile has a different fixing method, and our specialist roofers have developed the knowledge to know which is best for your roof during our 200+ installations. Next the aluminium bars that make up the frame are then locked into the anchors and screwed into place. We’ll check each bar to make sure it’s straight, and that all the bars are parallel. This is the most important step in making sure the panels will look correct. With the bars in place, the next step is to clamp the panels to the frame. Depending on what’s easier, we may fit the panels by row or by column. 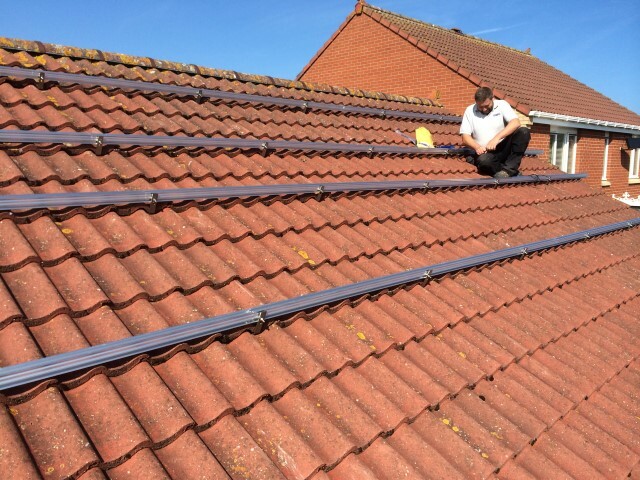 As well as taking measurements, we’ll check that the panels look straight – not just from where we’re sitting on the roof, but from down on the ground too. Roofs are very rarely perfectly straight, inevitably the ridge, the eaves and the ground will not run perfectly parallel to each other. PV installations look best when the panels run parallel to the edge that is nearest them, usually the eaves. We understand that after performance the aesthetics are the next most important aspect, so our installation teams will ensure you are happy with the layout. Panels are already wired by the manufacturer so connecting them is fairly straightforward. How we connect the panels depends on the system’s voltage, amperage and power, as well as the position of the panels and any shading on the roof. The wires connecting the panels are then kept off the roof tiles by attaching the cables to the rails the panels are clamped to. To get the finished system connected, we need to run the DC wiring from the panels into your home. Our electricians always work hard to hide as much of the wiring as possible by routing the cable into the loft space under the panels. While all this has been happening on your roof, the electrician will have been working hard to get the inverter connected to the rest of your property’s electricity supply. They will have mounted the inverter in a pre-agreed location and installed all the electrical safety equipment to make sure the system is safe. Before the final connections can be made, we will also install a small modern consumer unit and generation meter next to your existing fuse box which connects to the existing supply. We will need to switch your power off for around half an hour to do this. This is the exciting bit. Once the wiring’s complete, your project manager will switch on the inverter and power up the system. They’ll send the voltage readings to the team at head office, where we’ll check them against the expected performance and confirm the system’s performing up to standard. The final step is for us to apply for your MCS certificate. 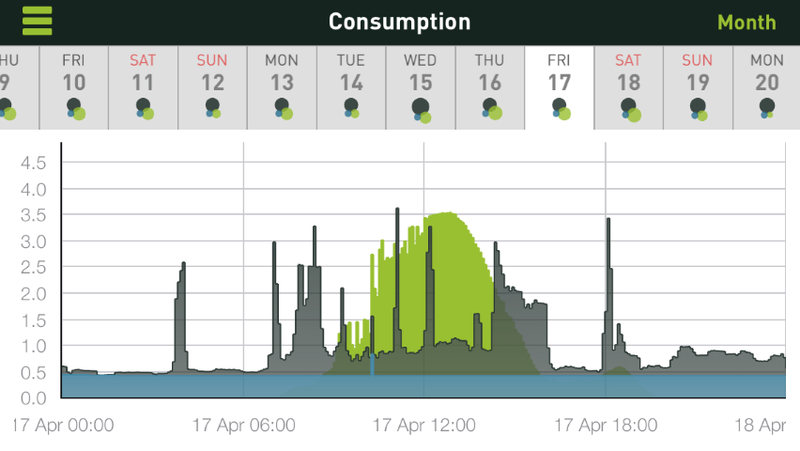 Your Samppee gives you real time information on the go, giving details on consumption and generation so you know exactly whats happening! 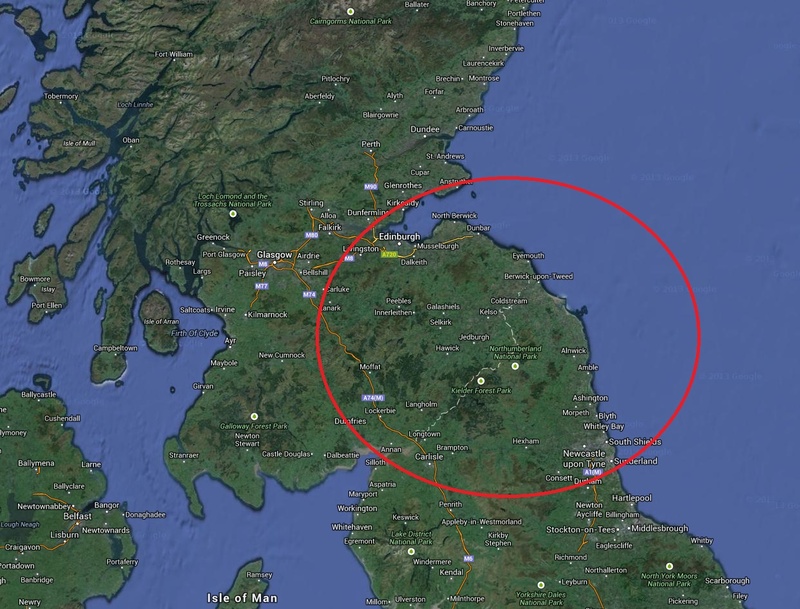 Based on the Scottish Border GMC Solar Head quaters are in Berwick upon Tweed, Northumberland. We operate within a 100 mile radius serving as far North as Fife and South to Newcastle, while serving right through the Scottish Borders. Every job starts with a free survey so why not book yours now! we only send a professional solar Engineer to site visits. We collect the information required to prepare you a quote which posted or e-mailed. There is no sales agenda on the site survey.